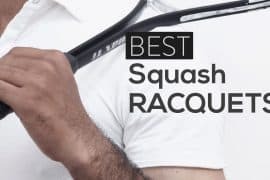 [Updated March 2019] Does the age-old adage “if you look good, you play good” really apply in the game of squash? After taking a look at the squash shoes available, we’d like to confirm that you will certainly look good! 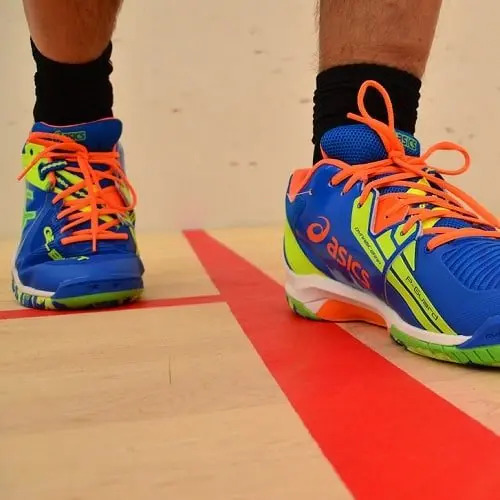 While many players first look at the squash racquet as the key piece of equipment in the game of squash, the argument can be made for your shoes as well. 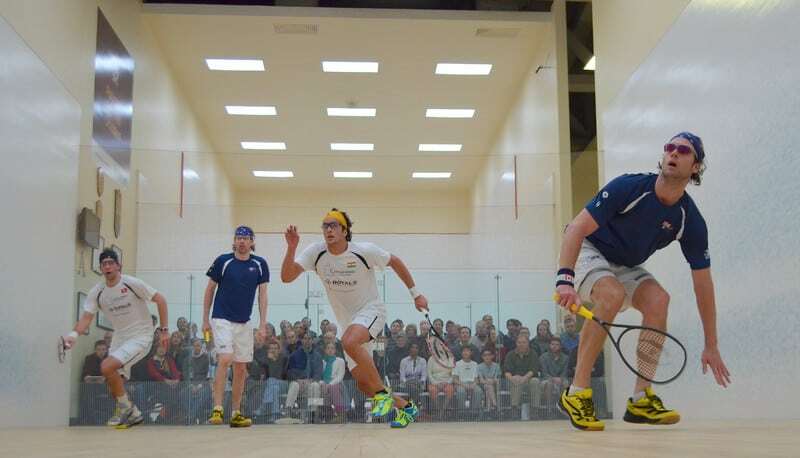 Squash is a game of movement, and the foundation of your movement begins at your feet. Just as having good footwork and movement on the court is critical to playing winning squash, solid footwear leads to better squash and prevents injuries while playing. We don’t want this to happen! How should my squash shoes fit? I’m a beginner, do I really need squash shoes? What are squash shoes made out of? How often should my shoes be replaced? What are the most common signs of wear and tear? Do squash shoes have good support for ankles and other joints? What should I look for in shoe that has a good grip on the floor? How much can I expect to spend on squash shoes? What adjustments can I make to a shoe that is a little uncomfortable? Are there other types of sport shoes that work well for squash? How do I care for my squash shoes? How do I prevent squash shoe odor? Do I need to break in my squash shoes? What are the best techniques for breaking in my squash shoes? How much do my socks impact the performance of my squash shoes? What are common rules that squash clubs have about shoes? The Salming Viper 3.0 Shoes are lightweight shoes that provide for fantastic movement around the court. Many players note the construction of the shoe, which is made of mostly fabric and leather with manufactured featured to suit any indoor court texture and environment. It provides maximum flexibility and comfort while being worn while providing stability for the wearer. This squash shoe has Salmings ExoSkeleton design. The ExoSkeleton design stabilizes the foot for lateral movements and reduces pressure at the Metatarsophalangeal joints (big toe and foot), which can be an area of grief for players with foot pain. While we really like this squash shoes, a few negatives should be noted. These shoes have a low profile, which may not lend itself the best for players with shaky ankles. Players have noted that for the price, they wish the shoe lasted longer as the heel support began to wear out. Another fault that has been noted is the laces, which many players say they need to replace. Just make sure you get some flashy laces if you need to replace them! The Prince NFS Indoor II Shoe are a synthetic mesh shoe which provides players with comfort during play and ventilation after. For players with wide feet, this is a great choice that provides all-around comfort for wide feet. It is also made with a toe cap for drag protection and materials both inner and outer lining which provides comfort, stability, and flexibility. They are made with a lightweight Nubuck material for the upper, a padded collar area, and a unique lace design to make it easier to achieve the customized fit. When you consider buying this squash shoe, you should know that this squash shoe carries a slightly heavier weight than other squash shoes and would not be the perfect choice for those who want to be quick on the court. While the shoe has a wide base, many players have noted they were not able to get as much toe support even with a protective lining on the tip of the shoe. The shoes are an overall great choice for squash and can handle the constant shuffling, lunges, and stretches of the game. The ASICS Gel-Rocket 8 court shoes are a perfect choice for the players still developing and honing their on-court skills. These shoes are light and come at a great price too. These shoes were originally part of the Asics Volleyball Shoe series, but the versatility of these shoes make them great on the squash court as well. If you think volleyball, your shoes need to be supportive given the jumping and landing you endure through playing. The Gel-Rocket provides great structural support for the cutting and planting in squash. These shoes are built with a special forefoot GEL® system that appears in the mid-sole. A positive of this feature is to move lightly and smoothly during gameplay. Also, the Trusstic System® technology is highly effective at maintaining the structural integrity of the sole. Asic’s makes these shoes with NC Rubber® which gives fantastic grip on the squash courts. These Asics are a great squash shoe for the price, but the manufacturer soles do not lend themselves to the best support. You will want to purchase shoe inserts separately for these shoes to prevent your feet from hurting. Also, the fabric on the outside of the shoes tends to rip, specifically on either side of the toes from the cutting and movement from playing a lot of squash. Designed in a few different colors and suited for both men and women, the Salming Kobra Shoe is another of the leading squash shoes. The Salming Kobra provides firm and stable positioning for players in the midst of fabric and mesh. This feature is great for foot ventilation. Seeing that squash is a fast-paced and rigorous moving game, the more flexible the footwear, the better the player is able to manage their game play. A negative feature of the Salming Kobra is the manufacturer soles. For better heel support, it would be recommended to get new soles or to place heel gel pads into the shoes. Though the “out-of-the-box” shoes provide comfort, there could have to be a more inward cushioned feeling for better support of the foot due to the various shocks being experienced. The Salming Kobra also has a rather stiff feeling which can make it a little uncomfortable in the case of flexibility though it excels in the area of sturdy support and court grip. Plus, the heel will not be worn down as quickly. Overall, the Kobra is a great choice for professional indoor sports players such as for squash games with its high-intensity factors. It has a high-performance rate and is among the most durable squash shoes to wear. The Head Sprint Pro Shoe are among the most durable and another great option for those requiring strong support from their shoe. This is another great option if you have wider feet too. The Head Sprint Pro shoe is built with a Micro-Fit that has the ability to deliver a snug mid-foot and heel. The thermoplastic polyurethane heel gives a very reliable stabilizer with the medial and toe rubber protection. In being durable and intact, one negative feature is that this isn’t the lightest shoe. If you want to be faster on the court, skip out on these. Also, the only breathability of the shoe is the mesh tongue. Because of the stability, the shoes are not that airy leading to hot feet. The Harrow Vortex Shoe is a great pick for play as it provides durability, quality made materials do come at a reasonable pricing for what they offer. The Vortex provides stability, a soft breathable mesh to provide maximum ventilation (and smelly feet) plus it is really lightweight. It is mostly fabric and can be cleaned and stored easily when not in use. Because of this, the Harrow Vortex is a flexible lightweight shoe. However, among the ills of this shoe was the lack of excellent toe support for players. Though the right sizing was selected, it still was an issue for the most part for some of the wearers. Among the setbacks of this shoe is the lacing factor which some users find to be the issues. They noted either the lacing area was wrong or there were problems getting it as needed for maximum comfort and safety while playing. The HEAD Sonic 2000 is a very stylish and comfortable pair of indoor court shoes intended for fast-paced activities like squash. They are well designed with an EVA mid-sole and a non-marking outsole that is low to the ground and made from rubber. This pair of HEAD shoes features many technologies to improve on a player’s performance and comfort, such as the hidden Heelstab system, highly responsive heel foam and an injected TPU frame. Also, the upper section of the shoe is made of a breathable Air Mesh material to further help with the comfort levels. The foot is well protected in the Speed Pro Lite II in view of the lateral stability while the CXG technology is useful for its ability to deliver reliable shock absorption. Plus, there is the Energy Bridge that quickly transfers energy from the heel area to the front of the foot when pushing off. The number one consideration in buying a new pair of squash shoes is to make sure the shoes fit correctly. While it may seem like common sense, this can’t be missed. Make sure your shoes fit your feet correctly! We’ve all been through it. We’ve sacrificed fit for cost or another factor and suffered the consequences. When you are buying squash shoes, this is not an area where you want to be flexible. In squash, your shoes are the foundation of your performance. If they are not comfortable and supportive, you will not be able to play to the best of your ability. Squash is a very intense game and when you play, your feet will naturally swell from the heat and movement. When you are trying on shoes, make sure they aren’t tight. Consider purchasing a half size larger than you normally would and don’t forget to consider the width of the squash shoe, not just the length. Playing with sore feet is uncomfortable and a lot less fun. During a game of squash you need to stop, start and turn quickly. However, you don’t want your shoes to turn too easily. You need good traction so you’re not sliding all over the place. The right soles will really help with this. Squash shoes should have a snug but comfortable fit. They should allow you to move and turn without causing you to slip. Look for a shoe that is comfortable and breathable. If you have previous joint pain or injuries, look for something that will give you the support you need. For a short time, you may be able to use whatever athletic shoes you happen to have. You will soon find, however, that in order to get better at the game, you will want a shoe that has a better fit and more support. Squash is a game where you will spend a lot of time running, stopping and turning. You will need to be very agile and you need a shoe that supports that kind of movement. While some athletic shoes will be able to support some of those goals, very few of them will have the same support as a shoe that is designed to meet the needs of the game. There are some athletic shoes that can be used for squash, though they are not ideal. Badminton and racquetball shoes are both acceptable substitutes. On the other hand, running shoes, tennis shoes and basketball shoes will all leave you unsupported and disappointed. Typically, the soles are mode out of a blend of synthetic rubber and gum rubber. Since most clubs have rules about non-marking soles, most shoes labeled as “squash shoes” will mention that the soles will not leave marks. This is very important since most clubs have serious consequences for not following the rules. A general rule of thumb is that you should replace your shoes the same number of time per year as number of days per week that you train. For example, someone who plays three times a week should replace their shoes three times per year, whereas a person who trains only once a week would only need to replace them annually. Often, you will see the first signs of wear on the sole. Your shoe will develop smooth spots, and much like tires on a car, you will have a difficult time having the traction you need to support your game. When the soles are getting completely worn, the sole may start to separate. These are shoes that are not safe and desperately need to be replaced. Shoes in this condition should not be used for squash. If you drag your toe or the side of your foot when you play, the upper part of the shoe might start showing signs of wear. Watch for holes in the toe or near the ball of your foot. Squash can be a sport that is hard on the joints. Squash shoes are designed with this in mind. Since you are constantly moving and turning, shoes that support your joints are important. If you need extra support for your ankles, look for a squash shoe that is a “mid-top” style. These shoes will have a higher top than an “average” shoe, without inhibiting your ability to turn and pivot like a high-top shoe. Keep in mind that there is more to supporting your joints than the outer part of the shoe. Look for good supportive cushioning so that all of your joints are protected from the impact of running and moving on the court. You will want shoes that have a flexible sole that can bend with your foot and a blend of synthetic and gum rubber. While most squash shoes on the market have non-marking soles, make sure that yours are among them. Most clubs have rules about shoes with non-marking soles and violating the rule could mean you are no longer allowed at that club or you have to pay a fine. Some of the most basic shoes are in the $45-60 range. In general, you get what you pay for, so you may find that the fit is not quite right or that the shoe wears out faster than you would prefer. The range for some of the more expensive shoes is $90, with some shoes getting to the $200 mark. While there is a wide range so that you can find something within your budget, also remember that you want a good supportive shoe that will enable you to play as well as you can. What are some common features other players look for in squash shoes? Weight of the shoe. Weight depends a lot on the player. While a heavier shoe means you may have increased ankle and joint support, a lighter show will help you be more agile on the court. Before shopping for shoes, be sure to asses where on that spectrum you would like to be so that you have the support you need and still be able to maneuver on the court. Breathability. Nothing is more uncomfortable than wet sweaty shoes. Look for shoes that will give your feet the opportunity to breathe while you play. Ankle support. Whether you have had an ankle injury in the past or not, you will need a shoe that can give your ankles the support they need while allowing the movement you need to play. Cushion. While cushion is important for keeping your feet comfortable, it is also important for your joints. Squash can be a high impact sport and your joints will need the extra shock absorption that they get from the cushion in your shoes. Grip. If you are not able to have traction on the court, you will not be able to play at your best. Look for a shoe that has a blend of synthetic and gum rubber so that the sole will give you the traction you need. Wear and tear. People who play a lot notice what shoes are able to last longer before needing to be replaced. Getting a higher quality shoe means both that your money was better spent and that you can spend more time playing squash and less time shopping for shoes. For some players you may not be able to find a shoe that is perfectly comfortable. If you find a shoe that meets your other needs and is within your budget, you can make minor adjustments to the shoe by looking for after-market insoles or adjusting how you lace the shoe. If you are just getting started in the game, you may not be ready to make a commitment to shoes that only work for one purpose. You also may be looking to get started with a shoe you already own while you decide if you are going to invest more money into squash. Badminton and racquetball shoes are comparable substitutes for squash shoes. Shoes for other sports like basketball, running or even tennis will lack the support and traction that you need in a squash shoe. If you take care of your squash shoes, they will last a lot longer and you can save money on replacing them as frequently. Take care of your squash shoes by wiping them off with a damp towel after wearing them. Also take care to let them dry out completely if they get sweaty before wearing them again. If you wear wet or damp shoes, you risk both the shoe and the health of your feet. There are a few products on the market to help you keep your squash shoes from getting smelly. Depending on your needs, there are sprays and other methods for deodorizing your squash shoes. One of the easiest ways to keep your shoes smelling fresh is to put a dryer sheet in each shoe after you are done playing. You should take a little time to break in your squash shoes so you can get used to the feel of them and help them form to the shape of your foot. Be careful, however, to break in your shoes inside so you do not get them dirty. 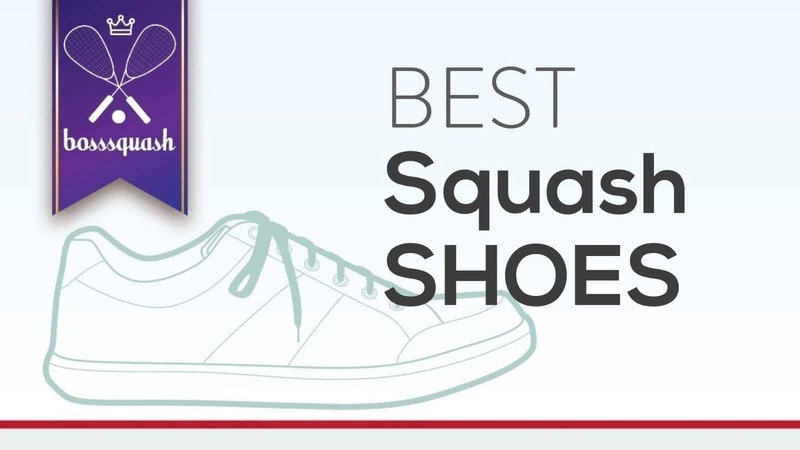 Many squash courts have rules about not wearing shoes that have been outside. Consider going for a walk around an indoor track or going for a walk around the mall to break in your new squash shoes before that first time on the court. Wear your new squash shoes around the house, at the gym or put them on when you get to the office. While you want to break them in before the first time you play in them, you do not want them to get dirty. Think about places where you do some walking and turning inside to keep your new squash shoes clean while you break them in. 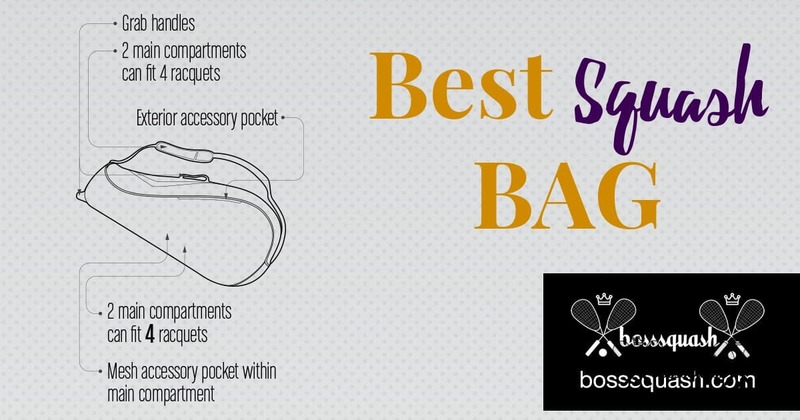 Every piece of equipment you take onto the squash court can either help or hinder your game. Including your socks. Choose socks that will work with your shoe and that are comfortable on your foot. If you prefer socks that are ankle-height, make sure they will not slide into your shoe while you are playing. There are several socks on the market that will help support your foot, ankle and other joints through cushioning and compression. Try a few different kinds to find ones that will work with your shoes and what you need to support your game. Non-marking soles. This is a very common rule and clubs take it very seriously. Shoes with black soles are the most common trouble-makers on this one, but make sure whatever shoe you buy has non-marking soles. Most shoes that are designed for squash will have non-marking soles, but it is worth checking before you make the purchase. Clean shoes. Most clubs will require that the shoes you wear on the court have not been outside. The idea behind this rule is that your shoes are clean. This means that no matter how worn out you are from your squash game, you should always change your shoes when you are coming or going to make sure your shoes are clean. Clubs spend a lot of money making sure the floors and other areas of the club are in good shape for all members, so they tend to be strict about the rules for shoes. 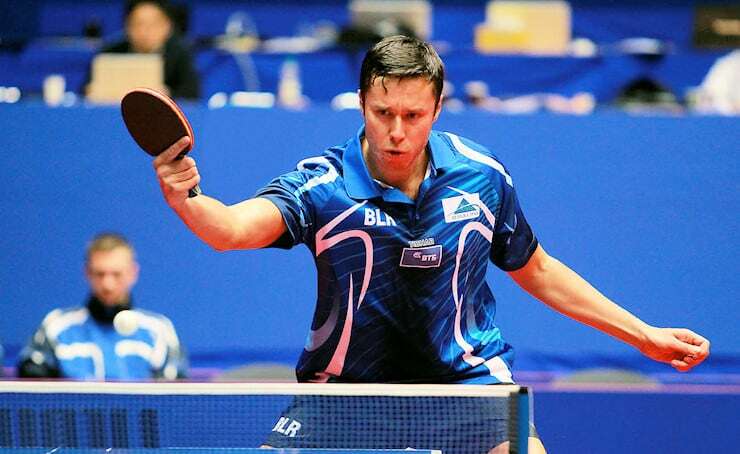 If you leave marks on the floors or bring dirty shoes on the court, you could face a fine or expulsion from the club. As a general rule of thumb, many players go by how many times they play in a week. I play 2-3 times a week and typically replace my shoes once a year. But I take my shoes to the limit and I won’t replace them until there is a hole in my shoe or the outer sole is peeling. If you’re feet start hurting, you should for sure consider a new pair. When considering a new pair of squash shoes, it ultimately comes down to your personal preference. There are plenty of options available, but you need to know what shoes comfortably fit your feet. Everyone will have an opinion on this, and sometimes players don’t even wear squash shoes on the court, and instead prefer basketball or volleyball shoes (like the Asics Volleyball series). We believe that you will play best in shoes that feel the most comfortable for you. For us, we prefer the Salming Viper 3.0 Shoes . The Salming Viper shoes look cool, have a premium build and are specifically designed with squash players in mind. However, if you are on a budget and prefer more of a cross-training court shoe to be used for other court sports, the ASICS Gel-Rocket 8 is a great squash shoe to consider. 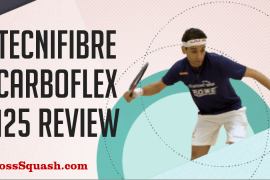 As you consider the best squash shoes for your game, we have also done some work for you in finding the best squash racquet for hitting a wide range of shots on the court. Well I sincerely enjoyed studying it. What about the Black Knight Reactor X8? Lightest of all. Best blog regarding shoes. Thanks for sharing it.